Wish you could change your look as easily as you change your mind? 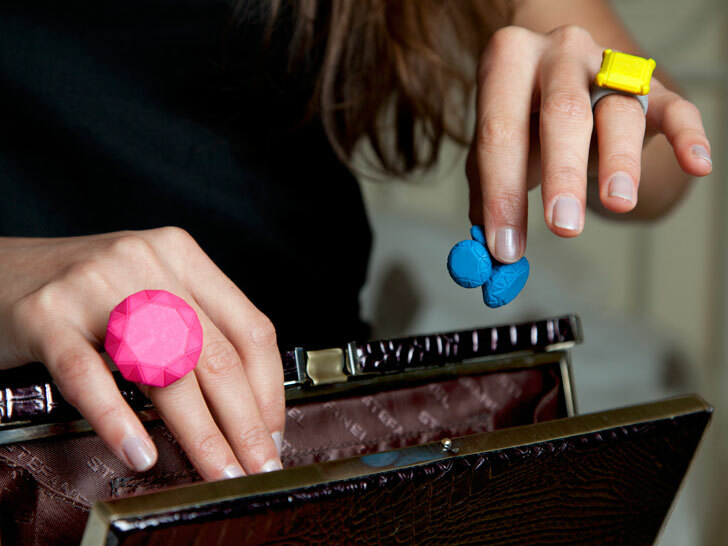 Brian Garret’s three-dimensionally printed rings are the accessory you need. Each themed edition—choose from “Evil,” “Posh,” or “Shrunk”—consists of a single band that snaps to one of three included “icons” using gold-plated, rare-earth magnets. “Jewelry is often so dull and static,” Garret told MocoLoco in September. “I wanted to change that.” Mission accomplished. Wish you could change your look as easily as you change your mind? Brian Garret's three-dimensionally printed rings are the accessory you need. Each themed edition�choose from "Evil," "Posh," or "Shrunk"�consists of a single band that snaps to one of three included "icons" using gold-plated, rare-earth magnets. "Jewelry is often so dull and static," Garret told MocoLoco in September. "I wanted to change that." Mission accomplished.